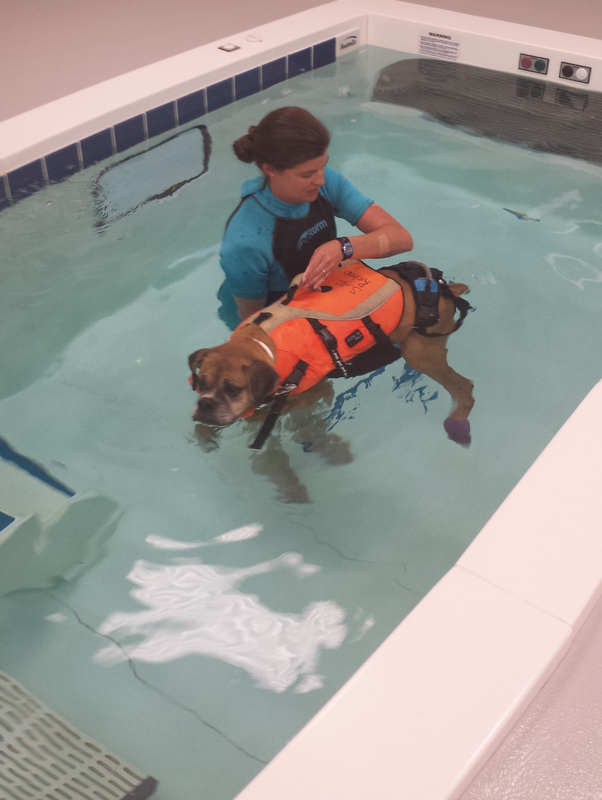 Bailey, under the supervision of Liz Hodson, during a session in the Physical Rehabilitation resistance pool. College of Veterinary Medicine Teaching Hospital. Last April, Bailey was referred to the Wilford and Kate Bailey Small Animal Teaching Hospital after months of excellent treatment by his local veterinarian. Owners Teresa and Vince Benefield, of Buchanan, Ga., watched their once-active dog stumble and stagger as he walked as though he couldn’t control his legs. “He looked like he was skating in an ice rink; his back legs were all over the place,” said Teresa Benefield. After admission to the Neurology/Neurosurgery Service and an examination by Dr. Amanda Taylor, Bailey was diagnosed with Degenerative Myelopathy (DM), a progressive spinal cord disease in which nerves lose their ability to conduct signals from the brain to the limbs DM leads to a final, heartbreaking state: the inability to walk, and unfortunately, there is no medication or surgery available. Following the consultation, the owners and Dr. Taylor decided to transfer Bailey’s care to Liz Hodson, a physical rehabilitation specialist and licensed veterinary technician in the Physical Rehabilitation Service. The Benefields and Hodson began to plan a course to keep Bailey on his feet for as long as they could. Last June, Hodson began a regime with Bailey last June to target muscles that would eventually deteriorate. Hodson’s treatment plan began a slow process, introducing him Bailey to daily walks, the therapeutic laser, exercises, an aquatic treadmill, a resistance pool, and a massage. 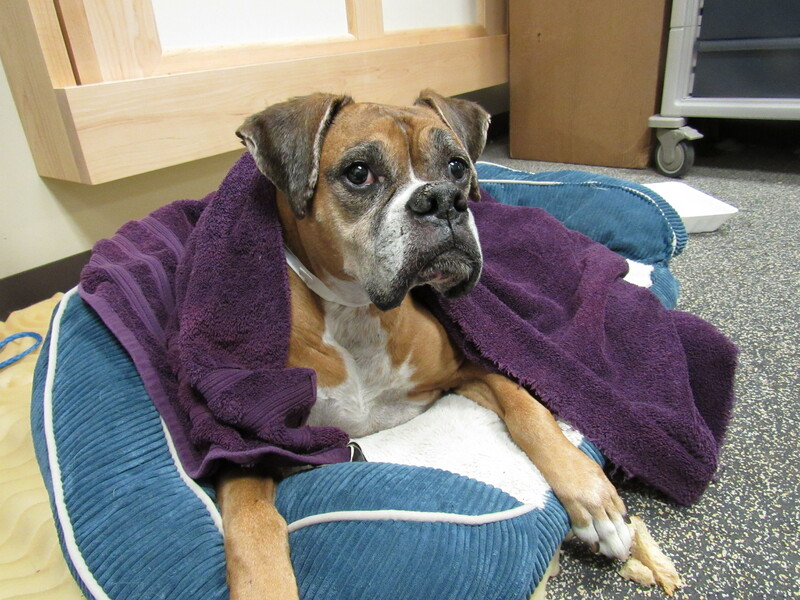 He remains a physical rehabilitation client, and twice each month, Bailey is a week-long patient. On Jan. 8, Bailey achieved a significant milestone: his 256th treatment … and counting. Statistically, the average time before DM overcomes a patient is 255 days; Bailey has beaten those odds. Bailey dries off and rests in Hodson’s office after his swimming session. Teresa Benefield credits Bailey’s health to Hodson, and the fourth-year veterinary students who perform their academic clinical rotations the Bailey Small Animal Teaching Hospital. “Each activity was chosen specifically for Bailey so I can focus on the muscles that are causing the most issues, specifically to help Bailey’s muscles retain their mass and function,” Hodson said. “The treadmill improves his gait and range-of-motion, while swimming in the pool loosens his muscles and provides a no-impact cardiovascular activity. “Daily walks allowed Bailey to do something he already loved, and helped him get familiar with the hospital and the people who work there, setting him at ease. In between, Bailey naps, staying well rested for the demanding schedule.